Here's a confession. Please don't judge or think that I am a bad mother. My minnies are 9 and they still have trouble riding a bike. Both girls can ride a bike, but neither one feels particularly secure without training wheels and both prefer a scooter to a bike. 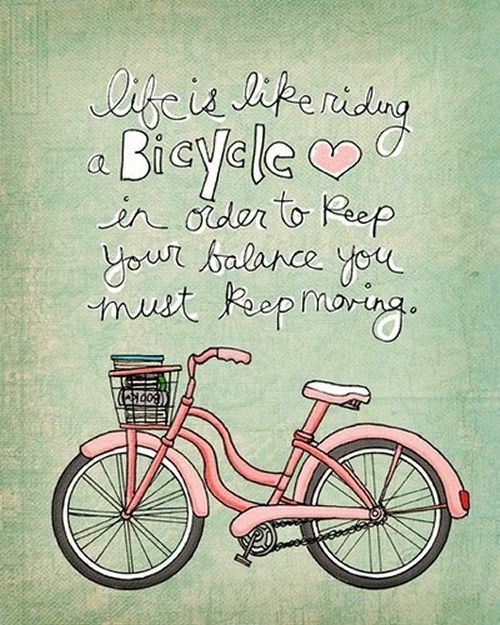 To me, riding a bike is one of those skills that everyone should have. Everyone should know how to swim, how to drive a car, and how to ride a bike. Don't you agree? Things are so much different for children now. When I was 9, I remember getting on my bike during the summer and exploring for hours. I would go to my friend Erin's house or we would ride our bikes to the pool or to Pizza Hut. My mother knew that I would be safe and she knew the two or three places I could possibly be. We had such freedom! Now, I won't even let my girls outside in the front yard without being with them. And they certainly are not allowed to just leave the house for the day to explore! The minnies are also involved in activities after school like dance, violin, and chorus during the school year. They're not over-booked, but we are busy. So sadly, their bike-riding time is somewhat limited. It's interesting because I've realized that I'm not alone in having children who don't ride bikes. 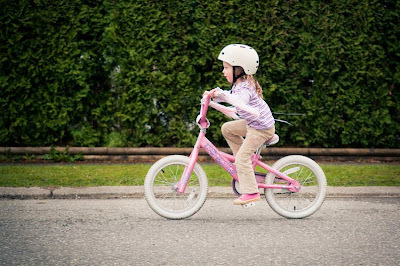 A crop of Learn How to Ride a Bike courses have popped up all over the place and many parents are enrolling their children. Luckily, my minnies don't need a class like that, but I do wonder if they will miss out on certain things later in life because they don't like to ride a bike. 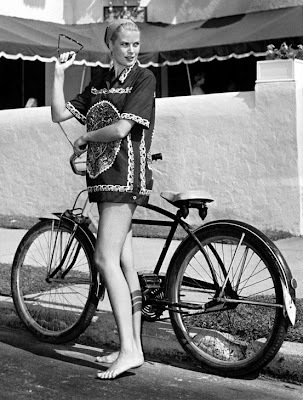 What if Princess Grace had never learned to ride a bike? My son was 9 before he had the confidence to ride his bike without training wheels. He had refused to try for about 2 years, but when we bought the lake house we all got fabulous new bikes and so he finally tried and of course picked it up straight away. My daughter had been riding since 5/6 and I had felt like such a bad mother for not pushing him to ride earlier. This post really helped me to! The photos are too cute, I'm sure your daughters bring you lots of joy. It's sad that kids dont have any freedom at all. We learned so much when we were kids! If every parent just let their kids go then it would be the way it was when we were kids. The problem is no parent wants to be the first one. Lawdy the things we got up to - and there was more danger then than there is now! It's sad how different the times are. When I was little, we would ride our bikes for miles. And that was before cell phones when our parents had no way to reach us. My daughter is 9 and can't really ride a bike but there's not really a need since, like you, I wont let her play outside and roam alone. Just found your blog this morning! I live in a fairly safe neighborhood in a rural setting. But I still wouldn't let my kids ride too far away from the house without me. Times have changed. Thus, they never rode their bikes very much either. I'm 20 years old and I still can't ride a bike! My Mom always laughs about this too. All thee of my kids (ages 10 and 7 year old twins) can ride bikes. I live in Northern CA and allow them to ride around the block alone (they are together I'm just not with them) I also allow the 19 year old to ride to the park down the street with the kids next door who are 11 and 12. A little indendence is a good thing. I grew up like you, in a different world. One where you did have to know how to ride a bike. If you didn't, you would be left behind. Literally! We rode for yours, all over the place. When I think about it now, I shudder. How did no one abduct us? How were we safe? Sadly, the times HAVE changed. I say don't worry a bit! The next time you go to the beach rent beach cruisers. That way if they fall, it's just into the sand :) That's how I learned to ride with confidence! oh my gosh! I was thrilled to see the picture of Princess Grace. That pic is in front of her parent's summer house in Ocean City NJ. The house is still there...at 26th Street...across the street from the beach! I hope you will let me use it on a future post...where did you find it...if you dont mind saying..
My kids ride their bikes up and down the street... Maybe around the block. We are so lucky to live on a cul-de-sac where they can ride bikes, skateboards and scooters all day! 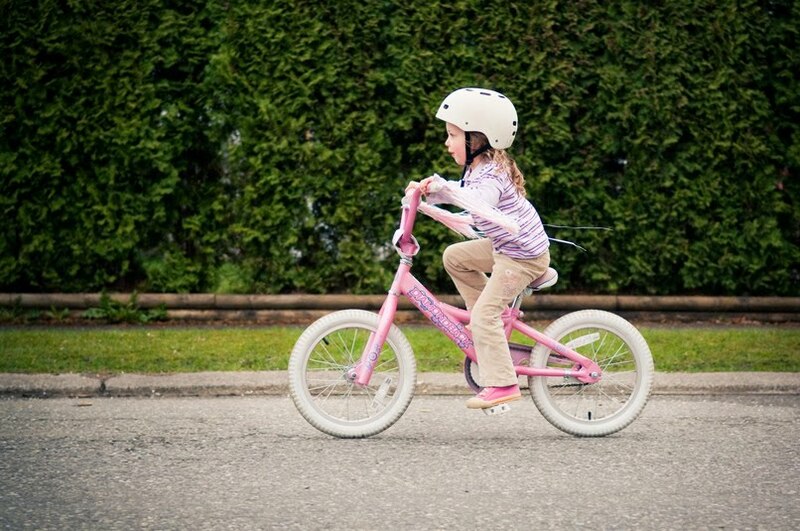 Awww I remember how much I loved riding my bike when I was little! HOpe you can swing by my blog sometime and leave some love! I don't think you're a bad mama, but I think you should encourage them to ride their bikes now that they're a little older. I agree with being terrified about them being out of sight. I have started to let our triplet 9 year olds ride around the block together. They come right back, and they know the rules about strangers. It gives them a bit of independence and exercise too! 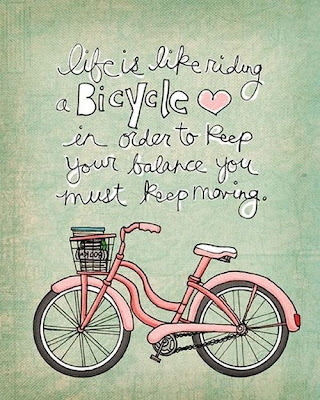 Plus, there is nothing more relaxing and fun than riding a bike at the beach!! !